The novel concept of rebirthing short sea shipping into what it once was or could be, may remain just that, a novelty. It would be paramount to overcome the “my way, on my terms” philosophy that so heavily drives traffic away from the seas and inland waterways and onto asphalt freeways that cannibalize natural resources. The plight of road warriors may even further drive coastal commuting straight into Davy’s Locker with the rapidly expanding development of non-marine-use shore side infrastructure. The waterways may be unclogged of traffic, but if they offer little to no practical places for docking, the purpose is diluted. Somehow, the concept of a working maritime waterfront has, over time, become less appealing than the allure of highly profitable seaside condos and retail space. Transportation planners also fail to maintain a solid grasp on the concept of intermodal transport. It typically takes two to tango and when both people and freight are shipped they will likely still require land side transport to their final destinations. This lack of vision or oversight recently forced a well known vessel operator to modify and lower the pilot house superstructure of their vessels when the city’s plans for a new low clearance bridge would essentially block his vessels into a small section of a major river. Despite rationalizing the impact, the unaltered bridge plans prevailed. All of this is clearly a case of short sightedness, begging for change. While the initiative of the Marine Highways Program is helping the cause, the potential of a working waterfront for short sea shipping and ferrying is hardly tapped. In fact, it usually takes some sort of catastrophe for maritime appreciation to be granted. This has been a reoccurring case in Manhattan, most notably with the maritime-assisted rescue on September 11, and more recently during power outage events and Super Storm Sandy that crippled subways and hindered key points of access. Similarly, out west in San Francisco, vessels came to the rescue when the Bay Bridge has experienced closures and when the local rail transit workers of B.A.R.T. went on strike. But, if these events fail to convince, the environmental card can also be played. While those of us in commercial vessel construction are very thankful for Senator Jones, we do understand that the Jones Act does create some barriers against making marine transport economically feasible. Boat builders will make the case that properly designed and constructed vessels will provide a certain level of cost savings that enables competiveness. 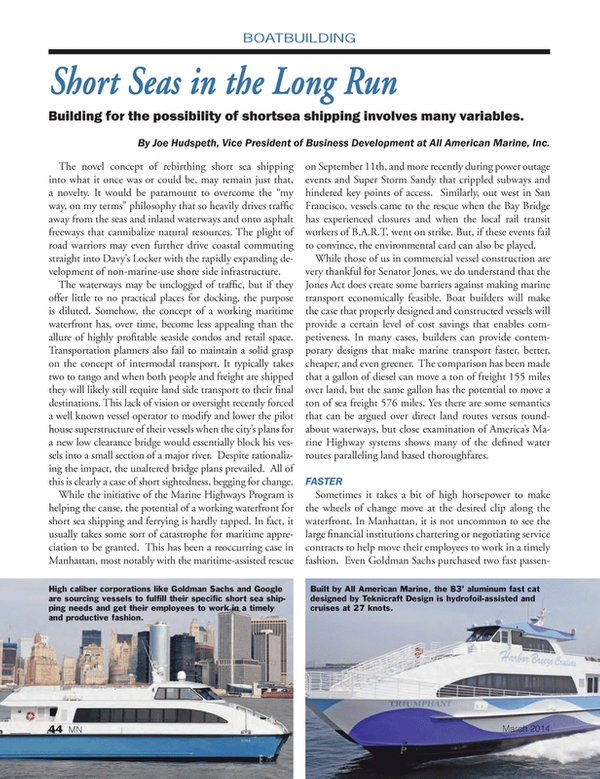 In many cases, builders can provide contemporary designs that make marine transport faster, better, cheaper, and even greener. The comparison has been made that a gallon of diesel can move a ton of freight 155 miles over land, but the same gallon has the potential to move a ton of sea freight 576 miles. Yes there are some semantics that can be argued over direct land routes versus roundabout waterways, but close examination of America’s Marine Highway systems shows many of the defined water routes paralleling land based thoroughfares. Sometimes it takes a bit of high horsepower to make the wheels of change move at the desired clip along the waterfront. In Manhattan, it is not uncommon to see the large financial institutions chartering or negotiating service contracts to help move their employees to work in a timely fashion. Even Goldman Sachs purchased two fast passenger catamarans to provide more frequent service on an existing run between the two ports at the doorstep of their skyscraping facilities in Jersey City and Battery Park. And now, Google has dipped a toe into the marine industry by recently chartering a high speed catamaran to shuttle their employees to work from San Francisco; thereby eliminating productivity hold-ups caused by daily traffic jams. Productivity for such high tech charters not only means a fast boat, but one with a few amenities. Given their colorful logo, it seems fitting to see Google employees boarding the vibrantly painted MV Triumphant for their chartered ferry demonstration runs. The 83’ aluminum fast cat designed by Teknicraft Design is hydrofoil-assisted and cruises at 27 knots to get the staff to work quickly and safely. Although the vessel built by All American Marine was purpose built for Harbor Breeze Cruises whale watching tours in Long Beach, California, the vessel features comfortable seating, functional table space, and a full galley to satiate morning hunger or provide a refreshing beverage during the return voyage at sunset. While the traffic-free commute can be enjoyed by employees and employer alike, it undoubtedly is the benefit of a sophisticated wifi system that truly give Google a return on this short term short sea investment. Vessel designs for near coastal transport and trade do not have to follow prescriptions of the past, as Google has been making a bit of splash with the current construction of their two mystery barges that are alleged to be floating product showcase stores. The deployable storefront is a very unique experience and could spawn an entirely new segment in the marine industry. Thinking this through a bit further, cruise ships also do quite well selling luxury items while afloat, so there must be some underlying connection between the lull of an ocean wave, the salty sea air, and the propensity to part with lots of cash for the trendiest new widgets. Equally impressive was the pioneering dream of Expoships to create a floating art gallery. In 2006, Nichols Brothers Boat Builders constructed the 228’ Seafair Grand Luxe that transports a fine art collection in a self-propelled, ultra-posh show room up and down the eastern seaboard. If this new side of the maritime industry takes off, it will help with recruiting and bringing new life into all sectors of our industry. Plus, ordering your morning latte from a boat that pulls into the harbor on coffee breaks might just be the best way to go. In order for the paradigm shift to occur and see the resources of our waterways properly utilized, vessel designs must be implemented that truly are environmentally friendly. Emission Control Area (ECA) zones and EPA Tier requirements for fuel burning engines are already steering the course for ship design. Other Eco-Pioneers are thrusting ahead with the implementation of LNG technology or hybrid solutions. And, the latest developments in low wake hull designs and hull coatings are symbiotic with coastal marine habitats. While emphasizing green technology is important, simply getting individual cars and trucks off of the freeways and onto well-serviced and consolidated marine routes can cut both fuel cost and pollutants, reduce road repair costs and drastically reduce highway congestion, all of which will produce immediate and tangible benefits. It works in Virginia – witness the I-64 Express between Richmond and Hampton Roads – between Connecticut and Long Island, and it can work anywhere else, as well. A new era of short sea shipping may be coming ashore in the near future, but without reform of the shortsea portion of the harbor maintenance tax (HMT), it won’t come in the sectors which most stakeholders hope for. Instead, the coming birth of the U.S. offshore windfarm market may in fact necessitate a new short sea fleet. Actually, the ideal design for windfarm support vessels closely mirrors practical characteristics needed for coastwise shipping. Fast, fuel efficient, and stable, these Jones Act compliant vessels are designed to transport crew and cargo safely and efficiently on coastwise routes less than 100 nautical miles offshore. The hull design is shallow draft and most support vessels even have their own cranes for moving cargo. While these vessels are designed for wind farm use, their concept seems practical for other coastwise trade and it could be just what is needed to give short sea shipping new life. The good news for American boatyards is that U.S. builders are very competitive on price with their foreign counterparts, specifically in the range of OSV-size vessels and down. In terms of quality, the volume and dollar numbers represented by U.S. small vessel exports alone speaks for itself. There isn’t any reason why all windfarm support vessels for domestic use cannot be built right here at home. Today, short sea shipping remains as a largely untapped resource for an island nation that is, nevertheless, experiencing a miraculous rebound in virtually every other phase of the maritime industry. How that could change depends on the usual political and commercial considerations that impact every business decision. When it does, the domestic boatbuilding industry is ready to step up and deliver.